The lands that we protect make up the special fabric of our home state. Prairies across the northern plains, mountainous deserts in the west, beaches and wetlands along the coast, and rolling hills in between all make Texas incredibly unique. Land trusts work to conserve these diverse landscapes, each with its own distinctive mission and geographic focus, to preserve the natural and cultural heritage of Texas. 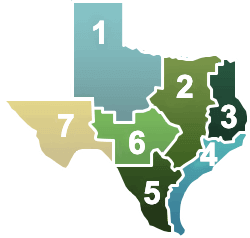 Scroll down for more information on all of our Texas land trust members, or select a specific eco-region (using the numbered map as a guide) to view the land trusts that operate there. Mission: A 501(c)(3) organization founded to identify, acquire, & protect sensitive Coastal Bend habitat essential to the nurture of birds, wildlife, & people. Mission: BLC works in the Houston area to preserve land along streams for flood control, clean water, and wildlife. Mission: To protect and preserve the land, water, scenic beauty, plants, wildlife, bio-diversity and natural, historic and cultural communities of the Big Thicket. Mission: Conservation of the natural and cultural resources of the Texas Hill Country. Mission: The mission of the Colorado River Land Trust (CRLT) is to work in partnership with landowners to conserve and protect land and water resources for future generations. Mission: Connemara works with farmers, ranchers and other landowners as well as city officials and forward-thinking developers to protect over 6,000 acres of land throughout North Texas. Mission: Conservation Force’s primary mission includes the conservation of wild places, wildlife, and a sporting way of life. Mission: A non-government agency promoting outdoor recreation, by helping acquire sites, donations, grants and information needed to build public parks and other facilities near Brazoria County. Mission: Ducks Unlimited conserves, restores, and manages wetlands and associated habitats for North America’s waterfowl. Mission: The Frontera Land Alliance (Frontera) protects—forever—natural areas, working farms and ranches, water and wildlife for future generations in the west Texas and southern New Mexico region of the Chihuahuan Desert. Mission: The mission of the Galveston Bay Foundation is to preserve and enhance Galveston Bay as a healthy and productive place for generations to come. Mission: To sustain the natural environment and enhance urban spaces through land conservation, community engagement, and education. Mission: The mission of the Guadalupe-Blanco River Trust is to preserve the unique natural heritage of the Guadalupe watershed for future generations. Mission: Hill Country Conservancy marshals public and private resources to preserve the natural areas and scenic vistas, aquifers and springs, rivers and streams, working farms and ranches, and the rural heritage of the Central Texas Hill Country for people to enjoy and cherish for generations to come. Mission: Hill Country Land Trust is a non-profit organization that focuses on the protection and stewardship of land through the holding of conservation easements in partnership with private landowners. Mission: Houston Audubon is a regional nonprofit conservation, education and advocacy organization that focuses on protecting the natural environment for birds and people. Mission: The Katy Prairie Conservancy works to protect greenspace for its conservation and recreational benefits, enhance wildlife habitat, restore tallgrass prairie and wetlands, sponsor scientific research, and offer public programming and activities to introduce the general and school-aged public to the sights and sounds of the prairie. Mission: The Native Prairies Association of Texas (NPAT) is a non-profit membership organization and land trust dedicated to the conservation, restoration, and appreciation of native prairies, savannas, and other grasslands in Texas. Mission: To protect natural and cultural resources and promote sustainable agriculture through education and preservation of open space in Central Texas. Mission: To conserve the Texas heritage of agricultural lands, native wildlife habitats and natural resources. Mission: TCMA exists to acquire, conserve and manage caves, and to promote research and education regarding caves and karst while providing responsible access to our preserves. Mission: The mission of Texas Land Conservancy is to conserve natural areas in Texas and to protect the physical and ecological integrity of their wildlife habitat, native plant communities, and scenic landscapes for the benefit of present and future generations. Mission: Protecting valuable, conservable land is essential to America’s environmental health and economic vitality. Mission: To conserve the land and waters on which all life depends. Mission: The mission of The Valley Land Fund is to preserve, expand, and enhance the native wildlife habitat of the Deep South Texas through education, land ownership, and the creation of economic incentives. Mission: Travis Audubon promotes the enjoyment, understanding, and conservation of native birds and their habitats through land conservation, habitat restoration and management, environmental education, and conservation advocacy. Mission: Protecting natural features in the riparian zone along creeks and streams, helping to safeguard the quality of the water we drink, the air we breathe and the food we eat – – right where we live. Mission: Wilbarger Creek Conservation Alliance works with farmers, ranchers, landowners, land trusts, and various sources of public and private funding to prevent fragmentation of family farms and ranches. Mission: To ensure that communities are aware of their connection and responsibilities to the watershed and are supported in implementing water policies and practices that will ensure ecological sustainability for generations.